New Delhi: Diplomate, National Board (DNB) candidates pursuing their PG medical specialisations from large private hospitals across the country have a reason to rejoice, as the government and the MCI Board of Governors have finally moved to establish MD-DNB equivalence. With the move, a long battle for DNB candidates, which had ensued after the MCI gazette notification of June 5, 2017, changing the rules, finally comes to a victorious end. 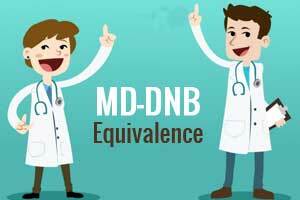 Medical Dialogues team had earlier reported that the issue of MD-DNB equivalence had become of the biggest bone of contention between the union government and the erstwhile members of the Medical Council of India. The Government has made its intention clear of providing equivalence to DNB candidates from large private hospitals ( more than 500 beds) to enter the pool of medical academia (Read- DNB will be Equivalent to MD in ALL Respects: Health Ministry Clarifies on NMC Bill) while the council has been clearly stuck on its stand of making such candidates do an additional 3 year residency in medical colleges, in order to become eligible for faculty posts. “MCI refused to count DNB course duration as work experience for teaching jobs,” a health ministry official explained to the Tribune. The issue of equivalence was also the first and foremost matter that was taken up by the MCI Board of Governors, who took charge of the council activities after the government ordered the MCI dissolution. With both the council and the Centre’s nod to the equivalence, around 2000 DNB candidates will be immediately available to join as medical faculty in medical colleges, and will indeed provide respite to the suffocating shortage of medical teachers in the country. DNB PG Entrance Exam is more difficult than NEET – PG. Also when they go for exam there centres r not known to anyone. Even exams r conducted in very far Areas which r not connected to gen public. MD/ MS Exams r at concerned colleges only. So DNB have big standards than MD/MS. All exams r scrutinised like this only. DNB Students r equally or more brilliant than other students .They go for DNB because they can\’t get seat for PG due to reservation policies. In my view Govt should not give reservation to PG. Reserve categories can earn by undergraduate degree. If they want PG they should compete openly now. Otherwise they should earn by undergraduate degrees only. So DNB r much better than MD /MS…. In my view passing DNB is very difficult than MD / MS. Also DNB students r practically & academically much better than MD/MS. So Govt should equalised these degree courses is welcome. They should be given all facilities like MD/MS. ….LABEL EITHER MD OR DNB.